rec. August 2015, Cardiff University Concert Hall, Wales. Kenneth Hesketh has yet to become a true household name but he has been forging a respected career for many years, and has appeared before on the pages of MWI in an interview with Christopher Thomas back in 2007, and two albums: Theatre of Attractions and Wunderkammer. His “fierce intelligence, breadth of knowledge and the incisiveness of his imagination” is brought together with Clare Hammond’s remarkable pianism on this BIS SACD, and what seems likely to become one of the contemporary piano music records of the year. Don’t be put off by the fistfuls of notes that open the programme. Through Magic Casements may take a couple of listens, but its references to the images in Keats’ Ode to a Nightingale provide enough clues to the contrasts between “the vibrant song of the nightingale with [the poet’s] own fevered state.” Mix birdsong and piano and there will be inevitable comparisons with Messiaen, but if you know the latter you’ll also know this is something coming from an entirely different, and not entirely comfortable place. Carrying on with the shorter works, Notte Oscura is a transcription from a segment of Hesketh’s opera The Overcoat, and while it has plenty of tremulously descriptive touches referring to “our Northern cold”, the effect is often pleasantly post-Romantic. Another collection that takes its starting points in material from another work for chamber orchestra, the Three Japanese Miniatures connect to Japanese folk tales. Descriptive and programmatic, these pieces are packed with atmosphere and drama, and for music with relatively short duration they have a feeling of momentous content and tapestry-like range of image and colour. The main act here is Horae (pro Clara), a series of twelve short pieces written for Clare Hammond over a two-year period, and as a whole forming a “breviary or book of hours.” Clare’s booklet notes refer to the “prodigious demands” made on the performer, not only “in terms of technical proficiency and physical stamina, but also in the sheer breadth of colour, variety of articulation and the intensity of rhetoric that is required.” Hesketh has described his music as ‘detailed and labyrinthine’ and as having ‘dense textures that are lucid and transparent’, and there are few words better for getting a hold on what to expect here as a first impression. I don’t always find myself in tune with this kind of uncompromising approach as I found out with Michael Finnissy’s The History of Photography in Sound (review), but with Hesketh there is a sense of poetic contact which I miss in Finnissy. Rather than turn his pieces into lengthy tracts, Hesketh engages through compact argument. You may not always agree with this composer’s point of view in musical terms, but by the time you have gathered your wits into some kind of repost he will have wrong-footed you with a gesture or inflection of sonority and line that once again has you interested and focussed. There are pieces that refer to the poetry of Yeats, or which overtly explore the composer’s “fascination with automata and his own concept of ‘unreliable machines.’” The ninth movement has a performance instruction, ‘like intertwining chime clocks’, and it’s not hard to imagine oneself in a nocturnal and haunted factory of wilful timepieces. The longest piece is the Molto misterioso, desolate twelfth, to which is added the quote ‘for now we see through a glass, darkly’. Dark, low sonorities and dynamic extremes create tensions that are not resolved by slow developments that commence in the higher registers. Slowness is challenged by passages of threatening violence and spectacular virtuosity, but this change in the landscape turns out to be a distracting detail – a golden-section carbuncle or knotted swirl in the blackened lines of a burnt stump, or the stump itself in the charred vastness of a dangerously smoking and tragic field. 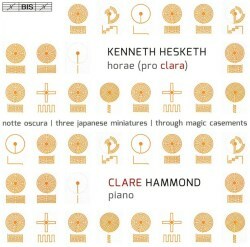 With BIS’s superlative sound, Clare Hammond’s amazing performances and Kenneth Hesketh’s challenging but rewarding musical language, I am indeed sure this is destined to be one of the contemporary/piano discs of 2016.